Heat oven to 350°F (325°F for dark or nonstick pan). Grease bottom of 9-inch square pan with shortening or cooking spray. Make brownie batter as directed on box. Stir in pecans and 2/3 cup chocolate chips. Spread in pan. Bake 28 to 31 minutes or until toothpick inserted 2 inches from side of pan comes out almost clean. Cool completely on cooling rack, about 1 1/2 hours. In small bowl, stir all Frosting ingredients using spoon until well blended. Spread frosting over brownies. In 1-quart saucepan, heat Glaze ingredients over low heat, stirring occasionally, until melted. Stir in 1/4 teaspoon hot water at a time, until mixture is thin enough to drizzle. Drizzle over frosted brownies. Refrigerate about 30 minutes or until glaze is firm. Cut into 4 rows by 4 rows. Can't find mint chocolate chips? Use semisweet chocolate chips and add 1/8 teaspoon mint extract to the brownie batter. What a refreshing combination! 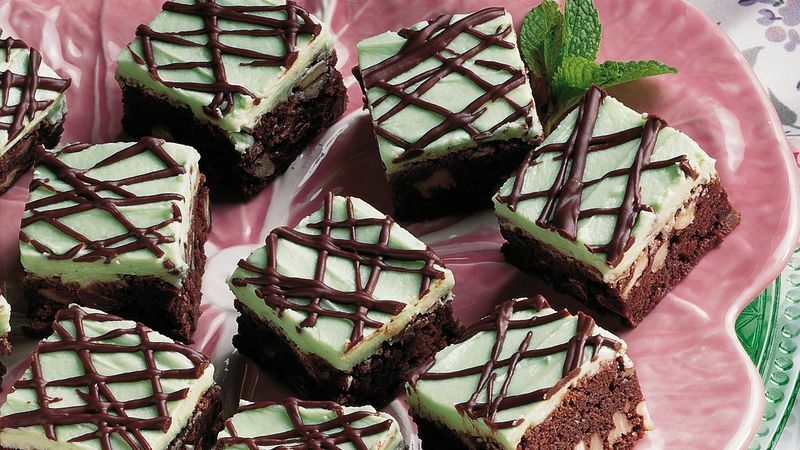 For another, try using raspberry-flavored chocolate chips for the mint ones and tint the mint frosting pink.